Conveniently located within walking distance from Pavilion Kuala Lumpur and minutes to Fahrenheit 88 Mall, Pavilion Residences Apartments Kuala Lumpur offers modern accommodations with easy access to Bukit Bintang Monorail Station. An airport shuttle service to the airport is available for a surcharge. All apartments come with air conditioning, a private balcony, sitting area, cable/satellite TV, and a CD player. 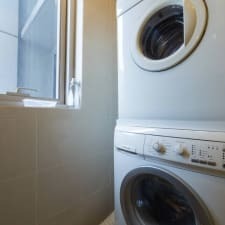 Bathrooms are private and include hairdryers and complimentary toiletries, while high-speed wired Internet access is provided in each apartment. A fully-equipped kitchen includes a microwave, oven, dining area, and a refrigerator. Pavilion Residences Apartments Kuala Lumpur features an outdoor pool, sauna, tennis courts, 24-hour reception, laundry service, express check-in/check-out, and a garden. Public areas are equipped with free Wi-Fi, and complimentary parking is available on site. Many restaurants that serve breakfast, lunch, and dinner are just a short walk away. There is a grocery shop nearby. Nearby attractions include Petronas Towers, Bintang Walk, Aquaria KLCC, and Pavilion KL. Many guests comment that the hotel is connected to Pavilion Shopping Mall through a covered and air conditioned walkway, and add that many restaurants and supermarkets can be found in the mall. Others like the amazing views of the city from the balcony, and add that the airport is just a short drive away. Most guests note that the apartments are spacious, with complimentary drinks and fruit baskets upon arrival, comfortable beds, and plenty of storage space for clothes. Others mention that the maid service cleans the rooms daily and restocks toiletries upon request. Many guests say that the employees are accommodating and always happy to assists guests in any way. Others state the receptionists can arrange transportation to the airport, recommend restaurants worth visiting, and provide guests with directions to the shopping area. Several guests report that the property is located next to a busy road, and add that there is constant traffic noise. Others suggest that light sleepers pack a pair of earplugs or close the windows in the evenings. Some guests point out that the Internet is not strong enough to reach the bedrooms, and say that Wi-Fi is only strong in the living area. Others mention that Wi-Fi is not reliable in some remote parts of the hotel. Several guests say that there are problems with ventilation in the bathrooms, which results in unpleasant smells. Others comment that there are many air fresheners in the bathrooms, but are quick to add that they don't help much.